Celebrate the rich and diverse wildlife of California annually on the Spring Equinox. Our California Wildlife Day event in Carmel Valley is quickly approaching! A free community event with activities for the whole family! Want to see your art, poetry or science on display? Follow the links below. He was a lover and student of Nature and the Wild. He inspired us with his powerful insistent message that our Garden of Eden - California - and the rest of the world, was in big trouble. He championed the role of our watersheds and served to draw attention to the loss of biodiversity, the plight of our soil, air and water, the pollution and desecration of our environment, and the rapid decline and extinction of species who make up this fragile extraordinary Web of Life that we are all a part of and depend on. We created a petition to get the word out. We decided not to use the Internet initially, to not use any of the online technology. We passed them out by hand and others joined our effort to ask the California legislature to pass a resolution making CWD! an official date on the State's calendar. Many exclaimed they couldn't believe we didn't already have one! By a stroke of good fortune, California Senator Monning was presented with our petition and he agreed to sponsor it with Assemblyman Mark Stone. The resolution was passed unanimously, uniting Republicans and Democrats in a rare mutual embrace. We are forever grateful to them and their staff who made this all possible. We are not an organized entity, just a group of friends who decided to commit ourselves to help support the many groups that are already working hard in our local communities to rescue and rehabilitate the needy, the sick and injured wildlife, forests, deserts and watersheds. And we are focused on our wonderful young people who want to learn what they can do to help in this work and offer their own invaluable thoughts and ideas. There is no one way to "do" CWD! It is up to each community and every individual to do what is meaningful for them and their own surrounding circumstances. We would like this day to be a joyous one, inspired by the love we all share for this special place we all call home ~ California! Click to View the Resolution! Thank you Secretary John Laird for your support of CWD! 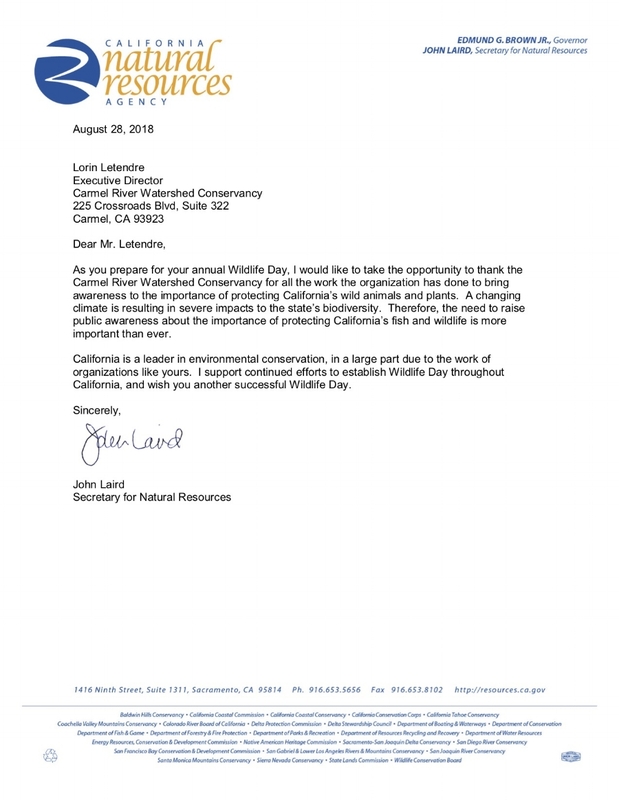 In August 2018, John Laird, Secretary for the California Natural Resources Agency, recognized the importance of preserving wildlife and the importance of California Wildlife Day! by writing a letter of support to Lorin Letendre, the Executive Director of our parent organization: Carmel River Watershed Conservancy. California State Senate and Assembly approve California Wildlife Day! On March 9, 2017, the California Assembly passed Senate Concurrent Resolution 23 with a unanimous vote, formally recognizing California Wildlife Day! Annual celebrations to promote environmental protection and awareness will help Californians preserve the natural beauty and diversity of the state for future generations. Many organizations have endorsed California Wildlife Day. See our list of partners to learn more about environmental protection, education, and conservation in the state of California. The Carmel River watershed celebration will be held on March 24 at Garland Park. Our resource page provides a list of references to guide the community in gathering information about California and the environment. Learn more about the unique biodiversity of California and get inspired to explore! This month we are featuring the cute little Western Snowy Plover. A threatened species that is endemic to the Pacific coastline and beyond, this tiny bird is found on sandy beaches, where human traffic threatens its nesting habitat. This shorebird relies on a diet of crustaceans, insects, and worms.